But especially insane was the group behind us, a starched and pinstriped sixsome of young, upwardly mobile bankers soberly talking business over a whole suckling pig plunked down in the middle of their table. Over fine wine and sober conversation, they gobbled up cheek, ear, tail, belly, cracklins, eyes, snout, feet, and finally, with great aplomb, brains. Although it was hard to imagine that any of the six of them had ever sat down to a table of ‘whole hog’ before, each seemed too socially constrained (a.k.a. afraid to look stupid) to register their…surprise, delight, horror, hunger, fear, disgust, primal lust – or whatever the array of emotions that an entire stuffed and cooked animal poised on a plate, apple-in-mouth, in front of one might incite. What I didn’t realize at the time was that a trend had begun to emerge among the city-peoples: caveman eating. Polite, sophisticated, formerly dainty diners devouring the entirety of an animal. Blood. Guts. And all. So what does this have to do with my juicy hay? Well, where do you think all those adorabla piglets begin their brief but scenic lives? My neighbor, Joe, raises animals for, ahem, slaughter. He’s been doing it long before it was fashionable for bankers to appreciate a good snout on toast or a nice head of cheese. 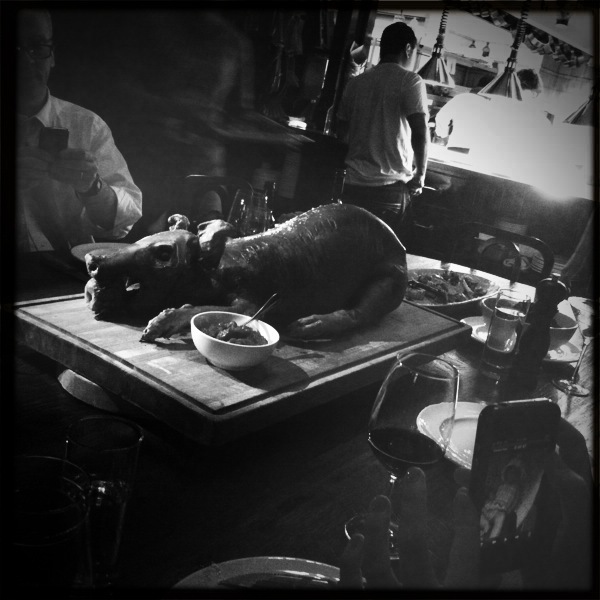 But now, Joe says, he can’t raise enough baby piggies to keep places like The Breslin happy. He sells them for a pretty penny and as fast as he can raise them. So when Joe looked lovingly out at our field, he didn’t see what we see: a picturesque piece of land we have nurtured for more than a decade and an uninterrupted view of the rolling hills. Joe saw baby pig food. Fertile grass. Juicy hay. Yesterday Joe mowed our field and in return he gets to keep the hay. 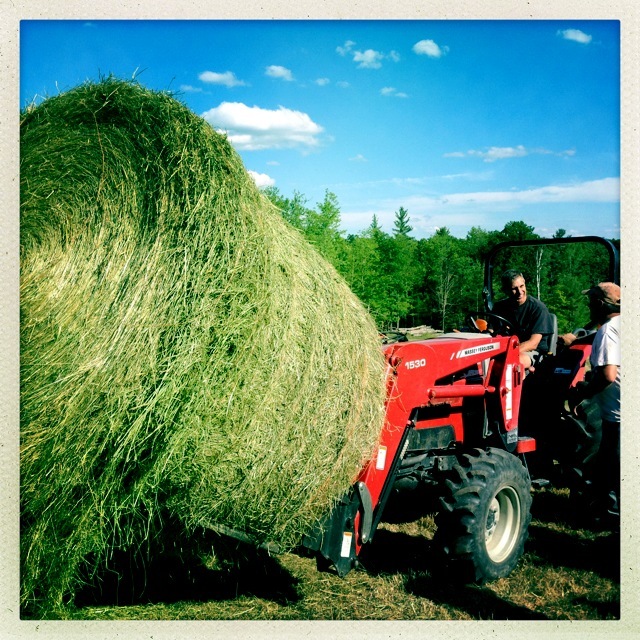 I snapped photos and watched in awe as the 1400 lb bales dropped out from the back of his rumbling machine. We even talked Joe into letting us keep the enormous things on the field until the winter when he’ll load them up on a flatbed and take them home. We think they’re cute. Joe just shrugged; he doesn’t know from cute.